Donnington Castle stands just to the north of Newbury on the junction of the road from London to the western ports and the road from the north to the southern ports. It was well placed to harass Parliamentarian communications. Two days after the First battle of Newbury, on 22nd September, 1643, Colonel John Boys, a professional soldier from Kent, was sent to Donnington Castle with a garrison company of about 200 foot, 25 horse, and 4 pieces of cannon. Boys realised that the existing fortifications would not survive long against artillery, putting his knowledge of fighting in the trenches in Flanders to use he spent £1,000 on strengthening the castle by instructing the construction of the ‘star’ fort earthworks. Three adjacent hundreds (administrative units) Kintbury Eagles with 20 Parishes, Faircross with 14 and Compton with 8 were laid under contribution to maintain the castle, providing a weekly payment, beds, etc. “England had not a better regulated garrison and better loved of the countrye than was this of Donnington“. Newbury, which held for parliament, felt differently, as we shall see. “Sir I am instructed by his majesty’s express commands, and have not yet learned to obey any other than my Sovereign. To spare blood, do as you please, but myself and those are with me are fully resolved to venture ours in maintaining that we are instructed with which is the answer of John boys”. On 31st July a general assault with scaling ladders was launched, but without any artillery support it was driven back with over 300 of his own soldiers being killed. On the 20th August Captain Tailor was shot through the head and killed whilst skirmishing with the rebels. However the rest of the Troop beat three times their number of rebels into the town of Newbury and killed 7 men and captured 9 musketeers and 2 Officers. On the 4th October the Earl of Manchester arrived to take over the siege, receiving another refusal, resolved to storm the castle, but his soldiers being well informed of the resolution of those within, declined that hot service. The parliament forces were ordered to storm the castle but were instead content to keep up the bombardment. …..there having been 19 days (12 at Speen, and 7 at Snelsmore) over 1,000 great shot was spent upon the walls of the garrison. Charles 1, with his army, moved towards Donnington and Manchester withdrew. On 22 October 1644 the King knighted John Boys at his rendezvous at Red Heath, then marched on to Newbury where he lodged the army being encamped for the next few days between Newbury and Donnington Castle, Speen and Shaw house. Early in the morning of the 27th October 1644, Colonel John boys with a strategic view from Donnington castle saw Waller’s horse at Lambourn, he sends 25 horse to harry their flank, later the same day the 2nd battle of Newbury was fought. The remaining Companies of the Earl Rivers Regiment supported Shaw House under the command of Colonel Blagg. The castle was an important factor in the battle, its strategic position causing the wide detour (13 miles from Clay Hill via Hermitage, Chieveley, North Heath, Boxford and Wickham Heath to Speen), whereby the parliamentary army attempted a pincer movement to entrap the kings army on both sides i.e Speen and at Clay hill. It was not a success, and no side could claim a victory. Prince Maurice was enabled to slip clear away to Oxford under the cover of night through the gap between Shaw House and Donnington Castle. The King himself set out to join Prince Rupert in Bath, leaving his crown , great seal and treasure in the castle. With the guns that were left in the care of Sir John Boys. “one stone would not be left on another“. “He was bound to repair the castle, but that by gods help, he would keep the ground“. The intended assault did not take place because of the death of the officer in charge, and disagreements among the parliamentary officers. About this time some parliamentary soldiers poisoned the castles well, which laid on the north side of the castle between their trenches and the castle earthworks, But the next day the Parliamentary Commander with the horror of the fact sent a drummer with a letter to Sir John Boys stating what had been done. “and at first opportunity drew 40 musqueteers out of the Castle, and in the face of the rebells cleaned the well, taking out the bag of poyson, and digging it deeper”. “we kept the well in despite of the rebells, and to make tryall whether or not the well was truly poisoned, we tried the experiment upon a horse, which having drunk of it, swell’d and dyed within 24 hours“. (the well is on the north-west side of the castle, about 400yards from the building, being screen by the lie of land from observation of the enemy on Snelsmore common, so that the garrison could easily get obtain water). Early in May 1645, five hundred Royalist Protestants marched out of Basing House, after a Religious dispute and travelled to Donnington Castle still un-besieged, but they were very properly refused admission by Sir John Boys. Sir John Boys continued to hold the dilapidated castle, he now had a rest bite as the Roundheads were occupied elsewhere. As soon as the main Parliamentary body left Newbury the defenders continued to launch raids on Parliamentarian forces in the area. John Boys made a sally into Newbury (then a Parliament town), and nearly succeeded in capturing the Mayor and other leading citizens and holding them up to ransom. By the end of 1645 Parliament was on the verge of victory in the war Donnington, like Basing was a constant thorn to the Parliamentarians and after the storm of Basing House 14th October 1645 by the Regiments of Dalbier, Pickering, Hardress Waller and Edward Montague, Cromwell gave the task to Dalbier for the total destruction of Donnington Castle to reduce it at all cost, having received instructions from the Speaker of the House of Commons 15th October 1645 to have Donnington “taken in”. However, Sir John Boys had not only provisioned the castle he had also, in view of Dalbiers advance set fire to Donnington and adjacent villages as commanded by the Kings Council at Oxford, to deprive the besiegers of cover. The humble Petition of the poor Inhabitants of Dennington in the County of Berks; shewing, That their Houses, Stables, Barns, and divers other Buildings, together with their Goods and Housholdstuff, were burnt and consumed, by the Command of Sir John Boys, Governor of Dennington-Castle, amounting to the Sum of Five thousand Two hundred Eighty-three Pounds and Eighteen Shillings, to the utter Undoing of the Petitioners, their Wives, and many Children; they consisting of Two-and thirty Families; was this Day read. The Articles, upon which Dennington-Castle was surrendered, were likewise read. The House called upon a Report, in the Hands of Mr. Lisle. And It is Ordered, That the Debate concerning Sir John Bois, and the Articles for Rendition of Dennington-Castle, be taken into Consideration, next after the said Report. Bitter winter weather postponed the attack on the castle during this time Sir John Boys sallied into the local area, beating down and destroying any quarters they found. The Kentish Regiment, regarded as traitors by their compatriot Sir John (who was a Kentish man), received special treatment. The large hole in the south-east tower that was later repaired in modern brick, is the apparently the work of this great mortar which had great shattering effect upon the castle the garrison as written in some reports 200 strong with 20 barrels of black powder and six pieces of ordnance. The Roundheads spent a long time knocking these towers down, however it was the newly constructed earthworks that was the Castle’s real defence. 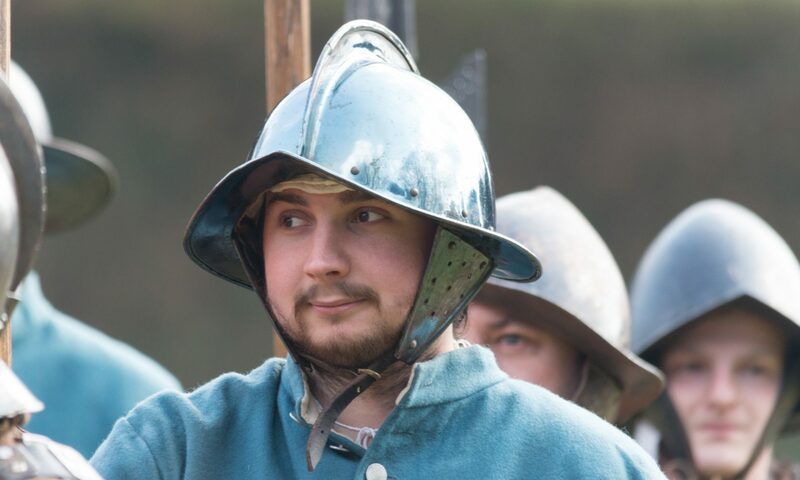 On 30th March 1646 with the Kings cause lost, at the Battle of Naseby, Dalbeire wrote to Sir John Boys telling him that he could not expect any relief and advised him to surrender the castle, whilst he might be able to give him honourable conditions. Sir John called a council of war, and it was agreed to ask Dalbier for passes for two Officers of the Garrison to go to Oxford. Boys held a parley with Dalbier and as a result, Captains Osborne and Donne, were sent to Oxford to gain the King’s orders. On 1st April 1646 the Castle finally surrendered. What remained of the Castle was then sacked and all the lead stolen, probably causing much discomfort to the Puritan owner, an MP called John Packer, who had only taken possession in 1640. Members of the original Regiment are buried at Speen Church on the outskirts of Newbury. Unfortunately no memorial remains to their whereabouts in the churchyard. Providence Improved by Mr. Burgha1l Vicar of Acton. ‘ Adderton – QJF9O/3 – No. 183 and 184.